Hunkered down on Friday and Saturday researching and listing stuff for my stores (passing up going to several promising estate sales and yard sales) so by Sunday I was ready to do a little picking. When I popped into Goodwill before church, I was in the mindset to buy but did not have a lot of time. This may have skewed my judgment a bit! My first find was a small flower painting that I kept looking at going “Is this any good? Or really bad? Or so bad, it’s good?” I kinda like the closeup of the flowers but not the massive, pink background or the crudely done shadow area. No signature so I’m thinking it’s a student piece. Hmmm…I might return this! Later on Sunday I went to our library’s monthly book sale. I can never resist these. I found a few books for my personal library (mais oui!) and a few to sell. I bought Galway Kinnell’s “Selected Poems” for myself, but at home I discovered it was an inscribed, signed copy. (I checked his signature online to make sure.) I was so surprised (and delighted) that no one who came to the sale yesterday found this! These currently sell at $30-$50 so this one is now destined for my bookstore. I also found a charming illustrated Jonathan Swift’s “Gulliver’s Travels” and a James Thurber’s “Fables for our Times.” I’ll admit I’m a sucker for illustrated books. And the Thurber book had an added bonus…there was a 1944 postcard from Mexico in it. (I do wonder if Marge and Adelaide are still alive.) These are also heading for my bookstore. Hoping to go to a liquidation estate sale tomorrow and towards the end of the week I’ll be relaxing at a resort and hitting up some thrift stores in Gilroy and Morgan Hill…virgin territory for me. So looking forward to it!!! As always, happy hunting. And if you’ve ever been tempted by anything in my Lion & Lamb Vintage store, use the coupon code FRIENDS15 at the checkout for a 15% discount. I think that plate is amazing! 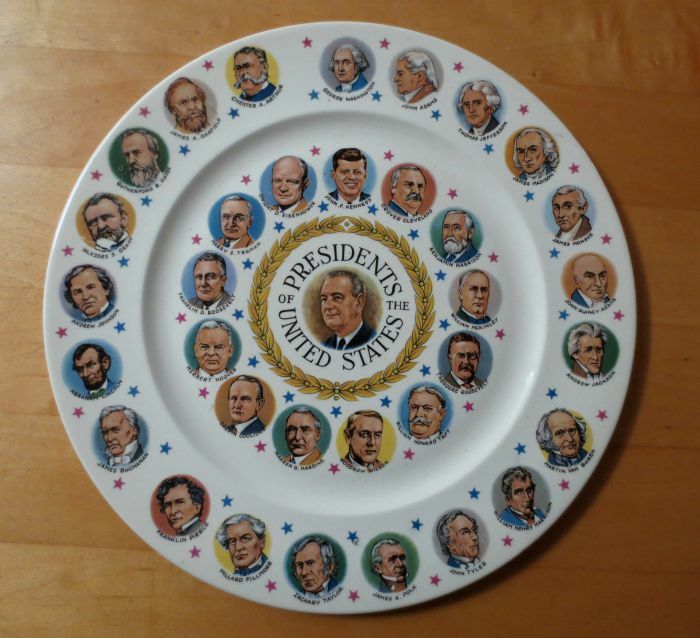 i WANT the presidents plate- it’s terrific; but i’m a big fan of kitsch!